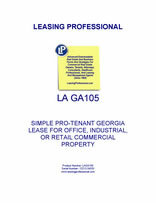 This form is for a single tenant Georgia lease where the tenant has superior leverage. It gives the tenant the right to use the premises for "any legal use," and has very abbreviated remedies for the landlord in the event of a tenant default. Landlord is the owner of land and improvements commonly known as _______________, Georgia (the “Premises” or the “Leased Premises”). The Premises are more particularly described in Exhibit “A,” which is attached hereto and incorporated herein.